A two-volume study of political thought from the late thirteenth to the end of the sixteenth century, the decisive period of transition from medieval to modern political theory. The work is intended to be both an introduction to the period for students, and a presentation and justification of a particular approach to the interpretation of historical texts. 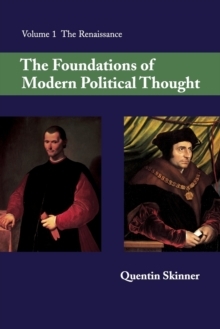 Quentin Skinner gives an outline account of all the principal texts of the period, discussing in turn the chief political writings of Dante, Marsiglio, Bartolus, Machiavelli, Erasmus and more, Luther and Calvin, Bodin and the Calvinist revolutionaries. But he also examines a very large number of lesser writers in order to explain the general social and intellectual context in which these leading theorists worked. He thus presents the history not as a procession of 'classic texts' but are more readily intelligible. He traces by this means the gradual emergence of the vocabulary of modern political thought, and in particular the crucial concept of the State.